Sheer Seduction is the name of this golden beauty from the Temperature Rising collection from Mac. 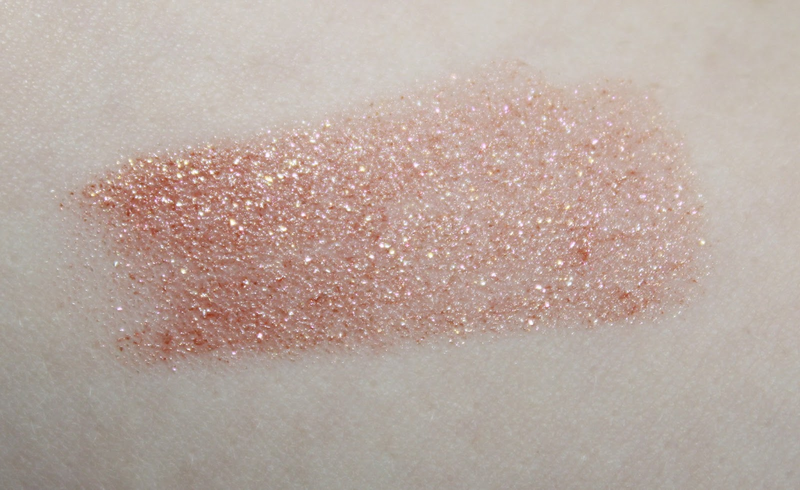 The finish of this shimmering shade isn't the usual, but in fact a Dazzle finish, which had me wanting to buy it more. The lipstick is a pretty golden bronze packed with miniature sparkles. Among the bronze shimmer are a few small violet and pink iridescent shimmer which really makes this shade unique. I adore this shade, and I just love how different it is. I'm very pale and I can still wear it, but it looks gorgeous on a tan. I used this shade recently in a photoshoot with Nicole which you can see here. The glittery lipstick really suited her tanned skin. When on my lips it still looks a bit pinky, but I think that's due to the slight pink glitter and how pink my lips naturally are. Even though it's a bullet of glitter it's not scratchy at all. It's really buttery which I'm really impressed with. There's nothing I had more than a really glittery, scratchy lipstick. I usually shy away from glittery shades, but this was simply to beautiful and elegant to pass up - I needed to add it to my growing collection of Mac lipsticks. The wear on this is really good as well, but can need a few top ups after drinking or eating, but it still has better wear than a lot of other brands of lipsticks. See the rest of the collection here, and grab your lipstick in Sheer Seduction at your nearest Mac store for £15.50. Currently sold out online. I love how sparkly this lipstick is, looks lovely! This is so pretty! I don't normally wear glittery lipsticks, but I will have to consider this one. Wow this is so glittery and gorgeous! Oh my goodness, this looks amazing on you! The packaging is so lush!